The UVF11A Sterilizer Water Filter is a complete add-on kit that can be added to most RO systems as a final stage. The UV sterilization stage kills the small percentage of viruses, bacteria, and other microorganisms that could potentially remain in the water after the RO process. Though most municipal water systems do an adequate job of removing organic microorganisms, the UV stage is a must if the source water is coming from a well, lake or stream where microorganisms breed, or other residential uses where bacteria is a concern. Combining a Reverse Osmosis filtration system with UV sterilization provides the most complete method of water purification available. The UVF11A features an 11 watt sterilization lamp shielded in a safe, protective stainless steel housing versus the 6 watt lamp commonly found in other products. For greater efficiency, a flow sensor switch turns the UV unit on and off automatically with water flow, saving power and lengthening the life of the UV lamp. Located in Alpharetta, Georgia for over a decade, iSpring Water Systems LLC is a family owned company specializing in reverse osmosis water filtration systems. 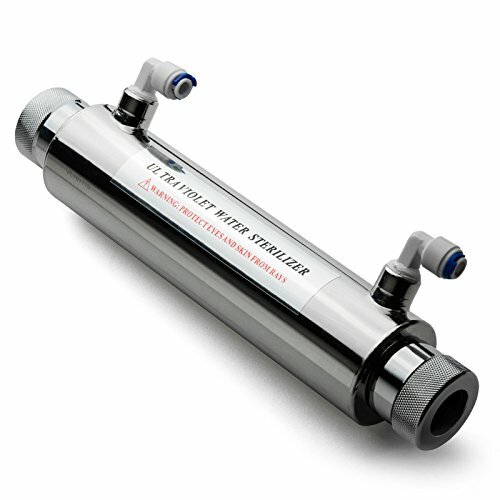 Our products include residential and commercial reverse osmosis (RO) systems, whole house water systems, ultrafiltration systems, shower, faucet, and counter top filters, filter cartridges and housings, RO coolers, and kitchen faucets and fittings. Our aim is to make high quality drinking water accessible for all households. With affordable pricing, solid quality, prompt delivery, and top notch customer service, we hope to assist in bringing you great water for years to come. Manufacturer: Ispring Water Systems LLC. Publisher: Ispring Water Systems LLC. Studio: Ispring Water Systems LLC.